Fidelity Investments Inc., most commonly referred to as Fidelity, is a multinational financial services Corporation based in Boston. It’s one of the largest asset managers with over $2.5 trillion in assets under management as of 2018. Fidelity ​has long been trusted for investments, money-management advice, insurance, retirement services, and securities execution and clearance. They are one of the biggest firms on Wall Street providing brokerage accounts for their clients. The company presents itself as the perfect partner for investors. The declared goal is to make complex, personal solutions user-friendly and easy to handle. ​For each and every point of entry the service starts with planning and advice. Fidelity promises to tailor the perfect financial service around the user’s individual requests, in easily understood terms and with transparent and competitive prices for trades and transactions. 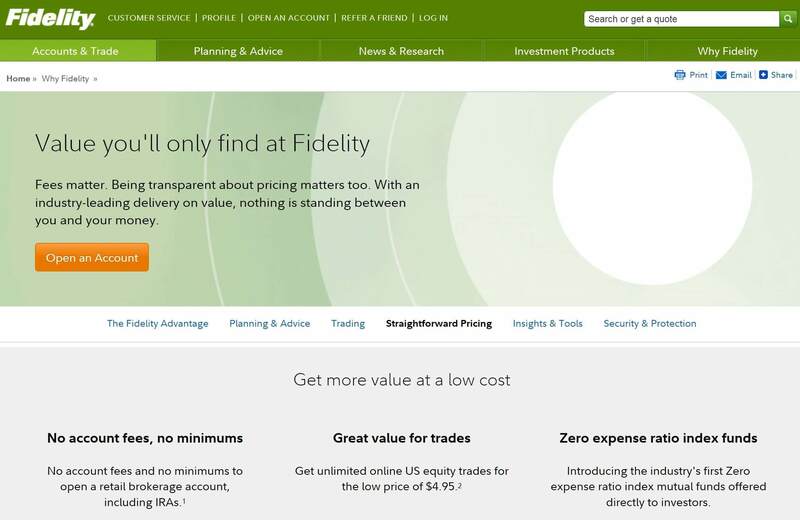 Fidelity Investments offers a lower flat rate pricing model than their competitors like TD Ameritrade and E-Trade do. ​This is probably due to the sheer volume of transaction that this broker holds during the course of the day, and therefore as far as pricing is concerned, this is a very attractive place to be involved with. That being said, day traders will look elsewhere, because Fidelity Investments brokerage account is not built for that scenario. If you are looking for fair pricing and a way to invest longer-term, Fidelity Investments is probably one of your better brokers. Fidelity Investments offers a single account, known as The Fidelity Account. It gives you opportunities to ​make a wide range of investments. It also provides independent and free research from over 20 providers. This gives you the ability to trade the stock market, ETF markets, options, mutual funds, precious metals, and bonds. Fidelity also offers international stock trading in 25 countries​. ​Fidelity Investments uses a proprietary software suite called Active Trader Pro, which is quite robust. It gives you the ability to stream live market data, do advanced trades and orders, manager portfolio directly from the dashboard, and customize the entire trading tool. However, Active Trader Pros is the ultimate flagship at least for active traders. Active traders? Yes, you have to make at least 36 trades in 12 calendar months to enable the trading platform access. This makes sense so far away that this high-tech platform is more likely to be considered for active investors. Long-term investors are more likely to use the web-based platform. User-friendly stock screening tools help with finding ​the best trade-ideas​ in every situation. ​Stock Screener to use with a PC or laptop as well as with a smartphone, to find promising investments that fit with one‘s personal criteria. They also give access to third-party experts' screens. ​Stock Research Dashboard to see and to validate opportunities for investments with a high possibility of being successful. Also these will be provided by third-party experts who did the research and this section includes tools for data visualization, like social trends, technical data and advanced charts. 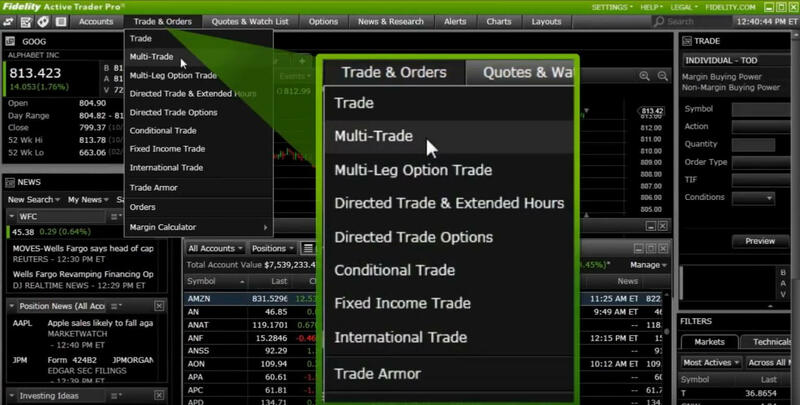 ​Active Trader Pro for buying opportunities with interactive charting. These charts help to create potential profit and loss scenarios indicating the best time for selling. Users will be able to work directly from these charts – to set alerts, to buy and to sell. ​Fidelity Investments offers many different ways to invest. There are the usual US-based stocks and options, ETF markets, bonds, and CDs, as well as mutual funds. There are a large number of mutual funds that are free to invest in, just as there are a considerable number of free ETF investments possible. Unlike many of the larger retail brokerage firms in the United States, Fidelity Investments allows you to trade in 25 other countries around the world but does require special permission. You can also collect profits in the local currency or sweep them back into US dollars. This gives you the ability to maximize your profits as currency fluctuation can work in your favor occasionally. Obviously, this is a much more advanced strategy, so if you understand foreign exchange and its movements, this can turbocharge your profit but can also work in the opposite direction. As mentioned previously, Fidelity Investments is one of the cheaper full-service brokerage firms. They offer $4.95 flat trading stocks and options, while there is an additional fee of $0.65 per contract on when trading options. ETF markets are charged at $4.95 as well, but some are $0 per trade, so checking that list is important. However, long-term investing should never be made based on costs of 5 dollars more or less, right? Bonds are traded at one dollar per bond for secondary bond trading and free for US Treasuries. Some of the mutual funds are zero expense ratio index funds, and there are no account maintenance fees. Fidelity promises transparent and simple prices without any hidden fees, offering $ 4.95 for U.S. equity trades plus $ 0.65 per options contract and low margin rates of 4.25 %. ​stock ratings from professional analysts in a single score with an Equity Summary Score by Thomson Reuters StarMine. ​Fidelity Investments has a plethora of tools and research that you can take advantage of. For example the Fidelity Viewpoints, a blog page with the latest industry commentary. The trading platform is also a very beneficial one. At least for those who trade at 36 times per 12 months. Beyond that, there are plenty of tools and calculators that you can take advantage of on the website as well. Fidelity Investments has an industry-leading research team and publications that are well known around the world. You have direct access to that without any extra cost as a Fidelity customer. Beyond that, there are also planners available for retirement planning, college savings, and of course your investment strategy overall. Most of the education is about financial health overall. It’s not just investing or technical analysis, but it gives you quite a bit of information when it comes to budgeting, managing your debt, and of course saving plans. They even have a budget checkup tool. One nice advantage is that they have a substantial tax strategies section that will help you keep most of your wealth going forward. Fidelity Investments also offers advice on charitable giving, sector investing, how to go about options, ETF trading, and stocks, but the technical bit of education is probably a bit light compared to other brokers. With Fidelity the Learning Center is hidden in between the News and Research. At least it exists and offers videos and webinars and a Quarterly education for day trading of all kinds of levels. Choices can be made according to the skills and knowledge and according to personal interests. And admittedly it may be checked out for free and without signing in first. This is a risk-fee way for potential investors to see if Fidelity may take them further. Fidelity Investments offers the ability to call a trading specialist via phone, and a huge help section on the website. There is the FAQ section, and you can email Fidelity directly to get help. There is also planning support and advice available. This is not necessarily customer service from a technical standpoint but gives you an idea as to what you may wish to do to reach your financial goals. To prove the quality of the service, Fidelity invites readers to their review on FINRA'S BrokerCheck. 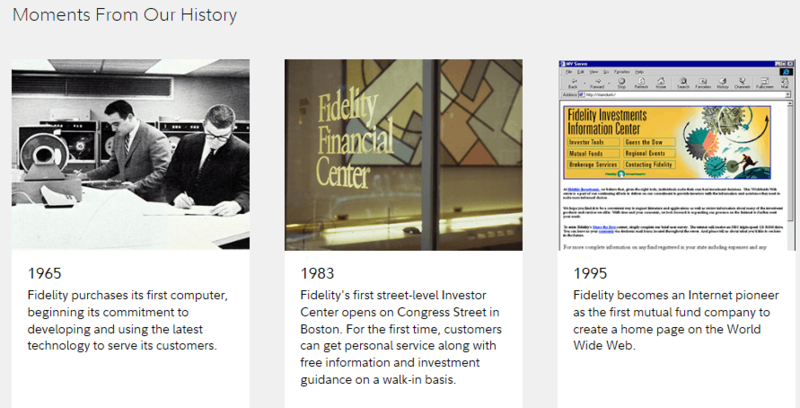 Fidelity Investments is by far one of the largest brokerage firms in the world. The pricing is okay for investing but not suitable for day traders. Think of it this way: if you are saving $2 on average per trade versus other major retail brokerages, then after 100 trades you will have saved $200 by just choosing the right broker at the right time — something worth thinking about before making the final step of opening a brokerage account. Compared with most of the other platforms in the business, it sounds new and promising that Fidelity will provide detailed one-to-one reviews of an investor‘s accounts – for free and also including accounts outside Fidelity. The ability to trade around the world is also an interesting feature. Taking advantage of global growth and benefiting from substantial macroeconomic moves in places like Europe or Asia is possible with Fidelity Investments. However, investments in foreign currencies come along with higher risk as well. Another advantage of Fidelity is that they give free access to the Planning and Guidance Center. This tool allows potential clients to see the complete picture of their financial plan, to find out how one is prepared for retirement. Besides, the tool creates investment strategies to suggest the next steps that should be taken. It might be useful to give this a try. The trading platform is rather robust, perhaps even more so than the average retail trader will need. However, too much of a good thing isn’t necessarily something that you should run from! The analysis and insight are rather well known and respected around Wall Street. 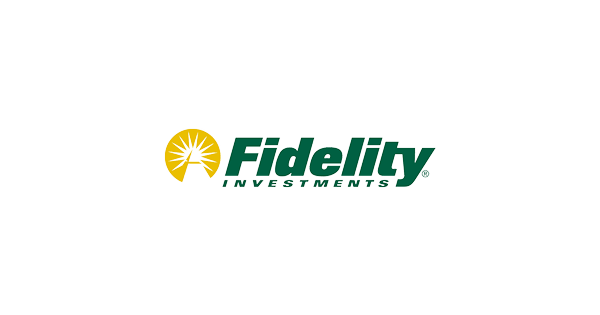 Fidelity Investments is one of the largest brokerage houses in the world and interesting for long-term investors and swing traders. ​Especially beginners tend to look for basic information and guidelines at first. ​Thus a clear the layout and easy handling are important for first-time users. 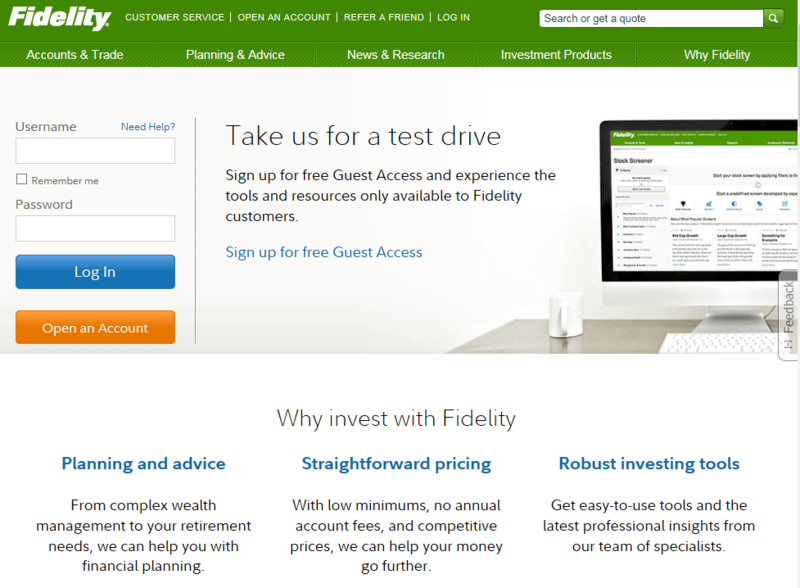 While Fidelity promises to make things easier, the website doesn't always look like this promise will be kept. ​Searching for specific pieces of information feels like fishing in murky waters, and as often as not one is not lucky. ​It was kind of hard to find the pricing structure. Most online brokers have their pricing on the front page. Fidelity does not. Interesting - The about us section is nearly hidden. Scroll down on the website to the last logo on the very bottom. There you see the link to the "about Fidelity" section. Don't get me wrong. It doesn't make Fidelity Investments a bad broker. I just have the feeling that they could improve their web design with more transparent navigation and a few more pictures.